The gross domestic product (GDP) numbers for the September quarter show that growth was driven by private consumption on the one hand and exports on the other. Investment demand fell off a cliff during the quarter. 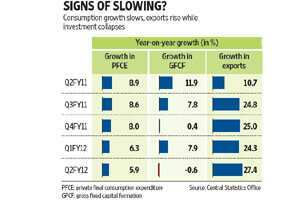 Unfortunately, though, with the slowdown in global growth, exports are unlikely to be strong in future, making the Indian economy rely slowly on consumption as its driver of growth. Moreover, the data show that private consumption growth too has been decelerating, thus leaving its sole growth engine sputtering. In the September quarter, the next big driver of growth has been the external sector (exports minus imports). Export growth went up 27.4% compared with the year-ago period, while import growth was a muted 10.9%. The net result was that the external sector contributed a huge 37.5% of the incremental GDP growth in the quarter. The third large sector of the economy—capital expenditure—contracted during the quarter from the year-ago period. Gross fixed capital formation (GFCF), therefore, contributed a negative 2.9% to GDP growth. Total investment demand fared a bit better, with increase in inventory contributing 0.8% and growth in valuables accounting for 8.7% of incremental GDP. The trouble is that the contribution of the external sector is likely to shrink considerably in future. The world economy is slowing and the uncertainty over Europe is likely to drag on. The OECD recently reduced its forecast for growth in the developed economies. China too is likely to see slower growth. All this is going to affect exports—indeed year-on-year growth in exports slowed appreciably in October. Now consider the year-on-year (y-o-y) growth in the other sectors. PFCE grew 5.9% in the September quarter, compared with 6.3% in the June quarter. So consumption demand, although still relatively strong, is cooling off. Consider also the trend in y-o-y PFCE growth (although these numbers are on the back of the old IIP series) : 8.9% in the second quarter of 2010-11, 8.6% in the third quarter and then a drop to 8% in the fourth quarter. It’s pretty clear that consumption growth is decelerating slowly and steadily. In the next few quarters, therefore, exports will no longer be an engine of growth, capital formation has already started to contract and the biggest driver of growth, private consumption, is rapidly losing steam. Given these trends, we could see a sharp fall in GDP growth rates in future. The saving grace, however, is good growth in agriculture. But then growth in agriculture was pretty high even in the second half of FY11, so the base effect will not be very helpful. Talking of base effects, it’s worth pointing out that the drop in GDP growth from 7.7% in the June quarter to 6.9% in the September quarter is worse than it looks, simply because growth was lower at 8.4% in Q2 of FY11, compared with 8.8% in Q1. GDP growth for Q2 of FY11 has also been revised down from 8.9% to 8.4%, but then that’s because of the new IIP series. On the other hand, it’s also true that one reason for the decline in overall GDP growth is the lower growth in agriculture. Agricultural growth was 3.2% compared with 5.4% in the corresponding quarter last year. Non-agricultural GDP growth was in fact 7.3% during the September 2011 quarter. That’s because services growth remained strong in Q2, although there has been a deceleration under the “trade, hotels, transport and communications" head. But “financing, insurance, real estate and business services" showed accelerating growth in spite of a higher base. It is doubtful, however, whether the strength in services will continue. The HSBC India Services PMI has been below 50 in September and October, which means the services sector has been contracting (compared to the previous month). Indeed, if we go by the PMI data, manufacturing has improved a bit in October, while services have deteriorated. Manufacturing growth has fallen to just 2.7% on a base of 7.8% growth in the corresponding quarter of FY11. In the June quarter, manufacturing growth was 7.2% on top of 10.6% growth in the June quarter of FY11. The deceleration in manufacturing growth has accordingly been very sharp. Finally, a word about inflation. The GDP numbers can also be used to gauge the level of inflation in the entire economy by comparing the numbers at current prices with those at constant prices. The difference is the inflation rate. Since the wholesale price index (WPI) data do not take inflation in services into account, the GDP deflator is a better measure of inflation. According to this measure, inflation was 9.1% during the September quarter, compared to 9% in the June quarter.